Are you planning to switch to Exchange 2013, or Office 365 anytime soon? Or maybe you need to migrate your mailboxes to another Exchange Server forest, and need a reliable tool that would reduce the time, cost and resources consumption? If your answer is “yes” to any of those questions, we’ve got some good news for you. We have just released new updates to our Exchange Server and Office 365 migration tools. 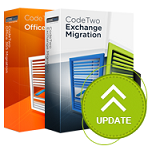 The new versions of CodeTwo Exchange Migration and CodeTwo Office 365 Migration are already available on our website. We put a lot of effort into making CodeTwo Exchange Migration and CodeTwo Office 365 Migration as user friendly as possible. The programs come with an intuitive GUI, comfortable connection wizards and a bunch of options that automate the pre-configuration work an make the entire migration process less time consuming. Both programs also offer a convenient reporting mechanism that helps to verify whether the migration of mailboxes was successful, or not. The programs can be tested for free with a limited number of mail items. In order to unlock the full functionality, you will need to obtain a license. Learn how to do this for CodeTwo Exchange Migration (for Exchange-to-Exchange migrations) and CodeTwo Office 365 Migration (when migrating to Office 365).